【SUPER FAST READOUT】Instant Reading Thermometer with high precision sensor gets temp readout within 4-6 seconds. 【1 YEAR WARRANTY! REGISTER your product after purchase and RECEIVE EXTENDED 3 YEARS Warranty】ThermoPro US Based Customer Service (Phone & Email) 5 Days a Week. 【WIDE RANGE】 Cooking Thermometer with temperature range of -58°F ~ 572°F (-50°C ~ 300°C), accurate to ±0.9°F; Celsius/Fahrenheit switchable; Perfect for indoor outdoor cooking, grilling, BBQ and so on; NEVER use the thermometer in a closed oven!! 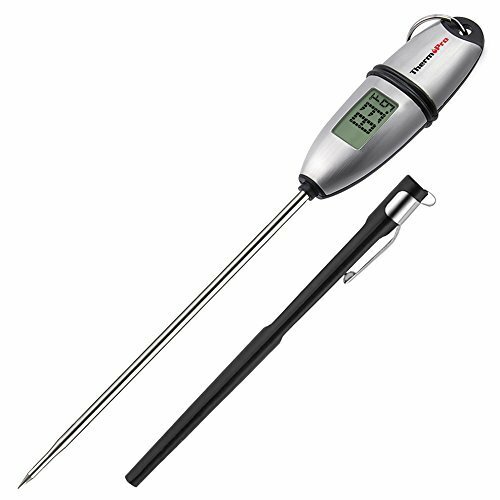 【EASY TO USE】 10 minutes Auto-shut off to save battery life and Portable grill thermometer design perfect for outdoor candy cooking BBQ and smoker.